Thoroughbreds from South Florida win everywhere. 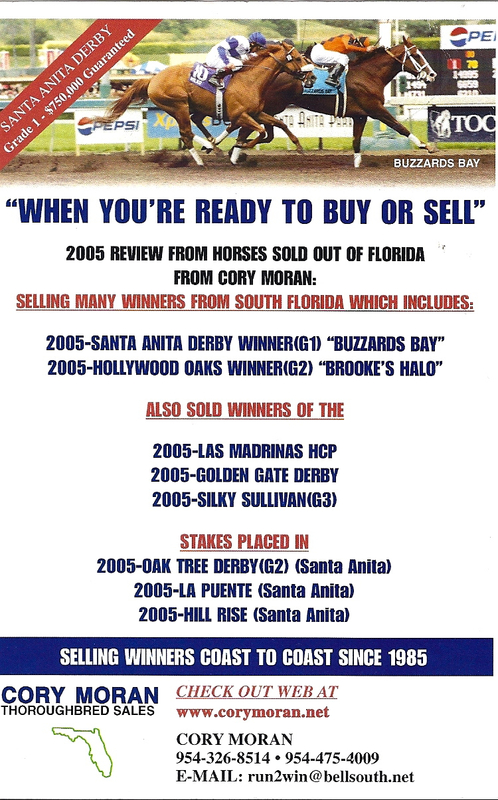 Horsemen from coast to coast come here to buy race horses. If you go to the sales other bidders drive the prices up, but our specialty focuses on runners who have already displayed a taste of their potential. I Fax and or E-Mail you current cuts (past performances) on selected horses I’ve seen run. I present their asking price to you. I work for YOU (the Buyer)-not the seller. I negotiate between you and the current owner. I follow up the vet-out examination, paperwork, shipping, etc.. Your inquiries are always welcome. Tell me your particular needs and price range, and let’s work together. I’ll make the whole procedure easy for you.